So I just went through the airport (6/1/18). 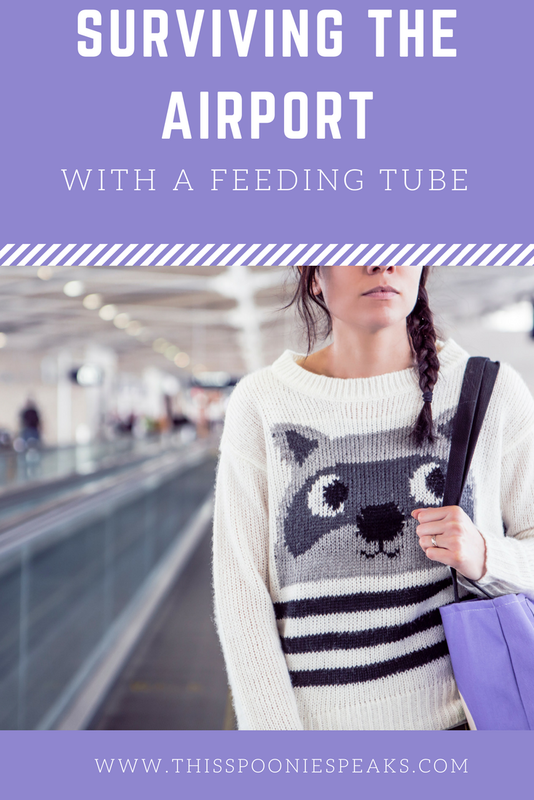 This is the first time I’ve gone through the airport with my feeding tube and if you’ve been following my Instagram you also know that I was literally just in the hospital with feeding tube issues, which will be a separate post in a day or two maybe. And I realize I’m doing this out of order but I will also be writing a post about what I packed and everything as well. Me, my parents and a family friend my dad went to school with have all traveled to Panama City Beach! We will be here for the next week chilling and enjoying the beach and the sunshine. And on Monday we will be doing something very special, I can’t exactly remember if I talked about it before so I’ll just leave it a surprise but trust me it’s going to be awesome. So getting through the airport wasn’t as difficult at all as people have told me it is. When we were checking our bags one of the workers actually stopped us from checking my formula. He has a sick child and told us we shouldn’t check my formula just in case something were to happen. Which honestly I completely agree with because if something were to happen I think it would be difficult to get my formula. Honestly I’m unsure if my formula is an uncommon brand or not, my formula is Isosource High Nitrogen 1.2. If anyone knows if this is an uncommon formula let me know because I’m curious. When I’m inpatient they substitute it with Jevity 1.5 High Fiber, which I hate with a burning passion. We got up to security and thankfully it wasn’t crowded at all, granted we got here at like one something I don’t remember the exact time. And I was also TSA Pre-Check with my parents, so that made the process a bit easier as well. But since I’m obviously attached to R2 they didn’t make me disconnect. (TSA Pre-Check only walks through the metal detector not the body scanner.) They had me walk through the metal detector to see if I made it beep, which obviously I did. And they had to pat me down, which I honestly recommend that you do in a private room because they were really deliberate and handsy it made me a little uncomfortable. I know they have to touch me obviously, but I don’t know, to me it just felt weird to me. Though they were gentle with my feeding tube area and everything and I told them about my port. They just hand to feel and look at it and then I was good to go. They also had to swab my hands and around the inside of my backpack and feel it to make sure there was nothing in it that wasn’t supposed to be. And all in all the TSA people were actually pretty nice, though we did get to them at a nonpeak time, but hey I’ll take what I can get and be happy with it. I also had my suitcase that contained all my medical supplies that also needed to be inspected. They looked inside of it and felt the seams like they did with my backpack. I also have a big bottle of liquid Promethazine that I put through my feeding tube, they opened the lid and put one of those wand things that they rub on your hands over it to get some vapors and tested it to make sure it was actually medicine. They didn’t bother my formula at all none of it got opened or anything. And past that, that was all that happened at the airport, though that was just our airport it could be different on our way home. All airports are different so experiences may vary, but there aren’t too many posts about traveling with a feeding tube and I wanted to put my experience out there so people don’t feel as confused and lost as I did. While the process is lengthier and a bit annoying, this isn’t going to stop me from traveling because I love traveling so much. Though I’m still recovering from our escapades through the airport I’m still happy to be here, even if all I can do is sit on the balcony and blog most of the time. The ocean is so soothing just hearing it makes me happy, so here’s to a good week!